This condo has 2 bedrooms and a loft, and 3 full bathrooms. The master suite has king size bed with an en suite bathroom. The second bedroom has two queen size beds and upstairs loft has two queen size beds. We manage another 3 Bedroom Disciples Village unit (DV 742) that is located across the street, that when rented together becomes a great option for accommodating large groups! This property is approximately a 2-3 minute walk to the slopes or you can take the complimentary shuttle to the base of the mountain. Boyne also offers free ski valet so no need to bring your skis back and forth! This is a dog-friendly unit and your are welcome to bring your furbaby for a fee. If the cold is not for you Boyne offers ten world-class courses. At Boyne Mountain you can enjoy the Monument and the Alpine. At Boyne Highlands are the Donald Ross, Arthur Hills, the Moor and Heather courses. The Bay Harbor Golf Course offers the Links, Preserve, and Quarry. All courses open to the public. A golf shop is on site at Boyne Mountain for all of your golfing needs. Nice size condo for 2 families with 4 kids. Great location for Avalanche Bay Waterpark, where we spent the day with the kiddos. Condo has nice layout and it was clean. Kitchen well stocked; however, adding a few inexpensive plastic storage containers would be helpful for guests. Management company very attentive. Upon our arrival we noticed chirping smoke detector...maintenance staff arrived within 30 minutes to replace all batteries and ensure all units working properly. If in the area, we would definitely stay here again. Stayed here 4-days in August. 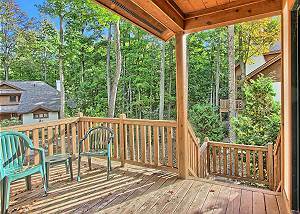 Great location for hiking and biking Boyne Mountain. Mostly quiet location. Lots of condos, so depends on how many people are staying in complex. The condo does not include a washer/dryer, but if you ask you can be provided with gate code for laundry facility in condo complex next door (coin only facility, so have quarters!). We have a small family (3 + dog), so had plenty of room. Condo was clean, had plenty of towels, A/C worked fine. Could not get the DVR to work. Bathroom faucets are backwards (hot water on right, cold on left) which is tricky. Manager responded to any questions quickly.Condo is only 15 minutes from Boyne City where we found groceries and good eats, 20 minutes from Petoskey and Charlevoix, and 1-hour from Traverse City. Lots to do in the area and good restaurants. Some favorites: Boyne Mt bike path, Avalanche Preserve, Petosky-Charlevoix bike path, Café Sante, Red Mesa Grill. The property was everything it was advertised to be and more. We loved how easy it was to find and it was relatively close to everything we needed to do for our son's wedding. The only issue we had was parking at the condo--apparently, no one uses the overflow parking! We would definitely rent this unit or any others if the need arises. Clean and convenient! We will definitely stay here again! This condo was perfect for our vacation. It was clean, modern, well-kept and well-stocked. The amenities of Boyne Mountain were wonderful. We would absolutely stay here again. We had a great time at Boyne Moutnain for Spring Break and enjoyed the condo rental. There was plenty of space for the 7 of us. There was a convenient shuttle that would pick us right up at the condo door and take us wherever we needed to go in the resort. Only issue was one of the bathroom flushing handles was not working properly when we arrived, we promptly let them know about the issue and they offered to send someone to resolve it. We did not need them to come right away as it was not an impact to us so we were fine with them fixing it after we left. My husband and I visited Boyne Mountain in March. We brought our fur babies with us and our babysitter. It snowed two feet after we got there, so of course, we had great skiing conditions. The condo was clean, well-maintained, spacious, and very quiet. We were the only ones in the entire building. Checkin process was very simple, as there is a code lockbox on the door and no need to have keys! There were plenty of supplies and we didn't need to get anymore while we were there. The condo was close to the slopes, so we just walked over to the Boyneland trail and hopped on the lift there. We also walked to the village and ate dinner and had drinks at 40 Acres Tavern. Great location! As it snowed for three straight days workers cleared the decks and sidewalks off, which was very nice. Parking was straight out from the condo, but you have to go up about ten steps to get to the door, which we didn't mind. Bedding was clean and comfortable. We had no issues whatsoever and really enjoyed our stay. We will definitely return next year! Thanks so much. This property drew me in because they allow pets which not many do. Turns out, that was just the beginning of the appeal of this condo. There are 3 large bedrooms all of which have their own bathroom (2 are en suite and 1 is off the foyer). The kitchen had everything you could need and there was a huge table perfect for meals in. The balcony off the master bedroom/living room was a great spot for us and our dog to hang out. It was very quiet although there was no one in the lower units during our stay. There were people in the other upper condo, but we only knew they were there because their car was parked next to ours. The property manager was very nice and attentive. I would definitely stay here again as it was well appointed, updated, and overall comfy. Easy online reservations. Property was in the perfect location and was kept up beautifully. This unit accommodated our puppy! Will definitely return again and reccoto our friends. Our stay was perfect until people moved in to the downstairs unit. They returned each night about 11:00pm and played music, talked very loud, and made lots of noise until 2:30am on Friday, Saturday, and Sunday nights. Also, there was a lot of shouting and noise from other condos that lasted until 3:00am those same nights. Management suggested calling security in the future. This was a great place except for the noise. The condo is smaller in person however it met our needs for our family's vacation. Upon arrival, there was a small problem with ants in the kitchen area, but a call to maintenance solved the problem. The condo was very well stocked. Getaway Ski Weekend A Success! We used this condo for a ski weekend. We'd never stayed at a ski-in/ski-out place before, and it was so convenient to be located so close to the resort & runs. The kids loved it, and so did I. Looking forward to returning. The place was clean and in a perfect spot for what we needed it for! Would recommend to anyone who wants a great spot up North. Everything was clean, pleasant, well stocked and worked well for our group of 6. We had a great stay at your resort. The unit was fabulous. Had a great stay. The rental was as advertised. It was clean, and the great room accommodated our large family nicely. We appreciated the customer service that we received one evening. After arriving home in the evening, we noticed that the air conditioning was not working and the temperature was rising. Having a severe asthmatic who depends on air conditioning, we were concerned. We placed a phone call, left a message, and also filled out a service form through the app, expecting to wait until morning for the situation to be remedied. Instead, at 11:00, a 24 hour heating/air conditioning technician arrived and had the unit serviced within a short amount of time. Though we would have made it through a warm night, we greatly appreciated this speedy service. Thank you! We had 10 family members stay for 3 nights and had a fantastic time. The condo was very clean and well maintained. Everyone had plenty of room. We had everything we needed to cook meals and such. Awesome vacation. Definitely recommend this place to anyone and will plan other vacations there in the future. Lovely condo but improvements could be made with the bedding. We stayed in the master bedroom and were surprised that the bed had a flat sheet on the bottom without a mattress pad. We also had to request a hair dryer. The code sent to me to enter the condo was incorrect and fortunately we had the number to call to correct this. On the plus side, the kitchen was very well stocked with pots, pans and cooking utensils. The condo was comfortable and met our needs.